The Deep Corporate Ventures website design was completed recently. Working on this project was indeed a delight for our designers. 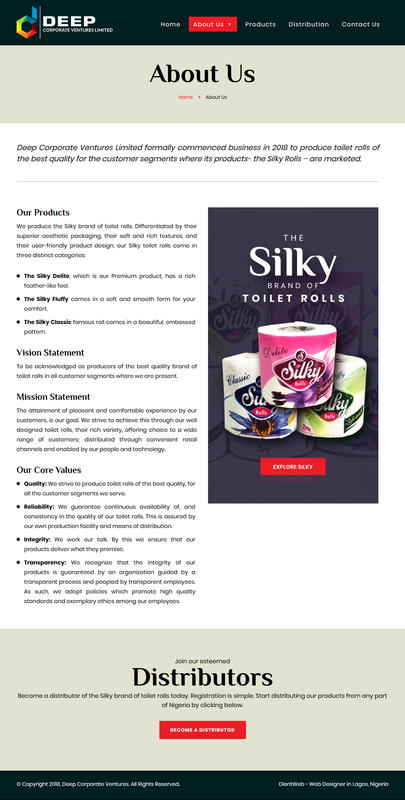 Deep Corporate Ventures Limited produces one of Nigeria’s finest brands of Toilet Rolls. Therefore, working with her on this project was like being a part of history. 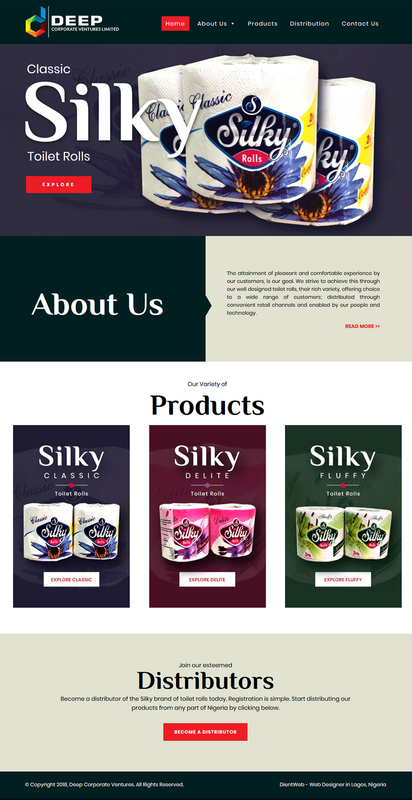 The Deep Corporate Ventures website design focused on showcasing her silky brands. Hence, It was our goal to introduce the brand attractively to users. A key requirement during the design was adequate product visibility. As a result, images were strategically used through the web pages. 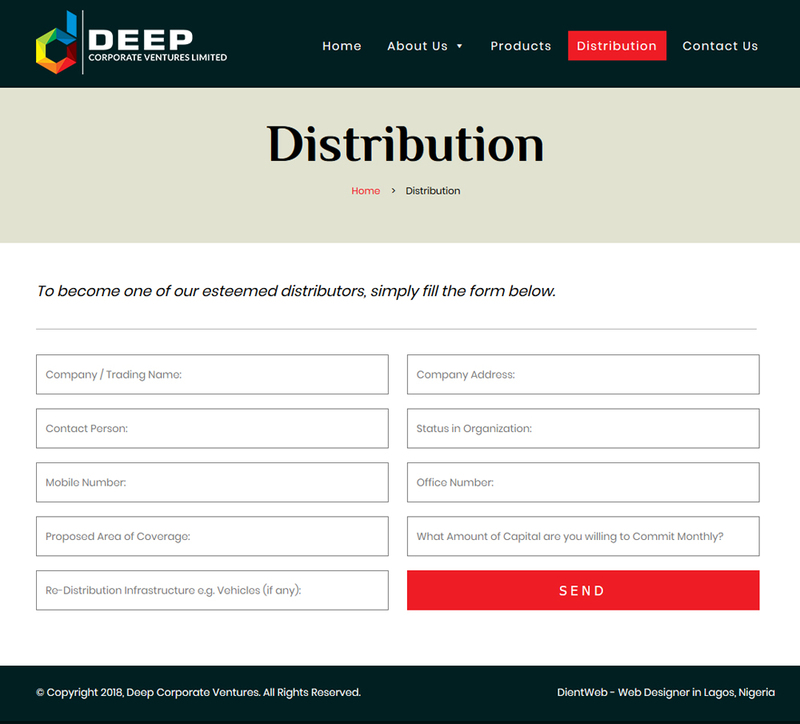 The Deep Corporate Ventures website has a distribution page. Thus, distributors of the brand will be able to register via the website. Website Design for Brands requires the right expertise for it to be effective. Thus, it’s always good to work with DientWeb. The Deep Corporate Ventures Website showcases her brands to a larger customer base. As a result, patronage for the Silky brands has continued to grow. Making sure your website communicates clearly is essential. Thus, we are always keen on what’s best. DientWeb has a team of some of the best web designers in Lagos Nigeria who are always ready to work with you. Beyond developing your website, you can also count on us for Technical Support and Online marketing needs. Contact Us here or check out our Website Development Packages here to get started.